UPDATED: To include Patricia Kambitsch’s beautiful doodle. We talk about the Art of Hosting as a practice. It is a way of being with self and other. This is sometimes a difficult concept to understand, because the world is full of lots of instructions about what to do. Telling me what to do is very useful in situations where I am doing things that can be repeated. For example, if I am building a cabinet, fixing a car, creating a budget or processing a claim, then you can give me a set of instructions that will be very helpful in most situations. Of course there is an art to all of these, which is to say there is almost always some part of the context of these activities that require me to be smart and creative and solve a little problem here and there. But in general, these kinds of tasks can be taught. But what happens when we are confronted with a huge question, for which the answers are unknown? What happens when things shift in ways that we have never trained for? What do we do then? If you have trained as a martial artist or as an athlete, you will know that only with practice can you be ready to face the unexpected and create a good outcome. In martial arts, the point of training is not to rehearse every single situation so that you can create a logic tree of what to next. Rather the point of training is to actually get to a place where you don’t need to think about what to do next. It helps you to react wisely, rather than blithely. When confronted with the fight of your life, you act from clarity and calm and resourcefulness, none of which you can learn in the moment. It is the same with the Art of Hosting. Art of Hosting workshops are not “trainings” in the typical sense of the word. Rather they are practice grounds – dojos if you will – where we can come together to spend a few days in a heightened sense of conscious awareness about what it takes to create and hold space for good conversations. In other words, the best way to come to an Art of Hosting is to prepare to pay attention in every moment to how you are practicing the basics of being in conversations with other people: being present, being an active participant, taking responsibility for hosting and co-creating a space together. Luckily, we can also practice the Art of Hosting outside of workshops and facilitation sessions, because at its core, the Art of Hosting is about being together with another person consciously. This means that this art is extremely easy to practice because there are 7 billion humans on earth and each day we interact with dozens of them. So every moment can be a little learning journey; every conversation, no matter how brief, can be practice. And what are we practicing for? We are practicing for the sake of practice. The practice is the practice. For a world that is addicted to measurable outcomes and a linear progression of competency that leads from beginner to expert, this seems absurd. 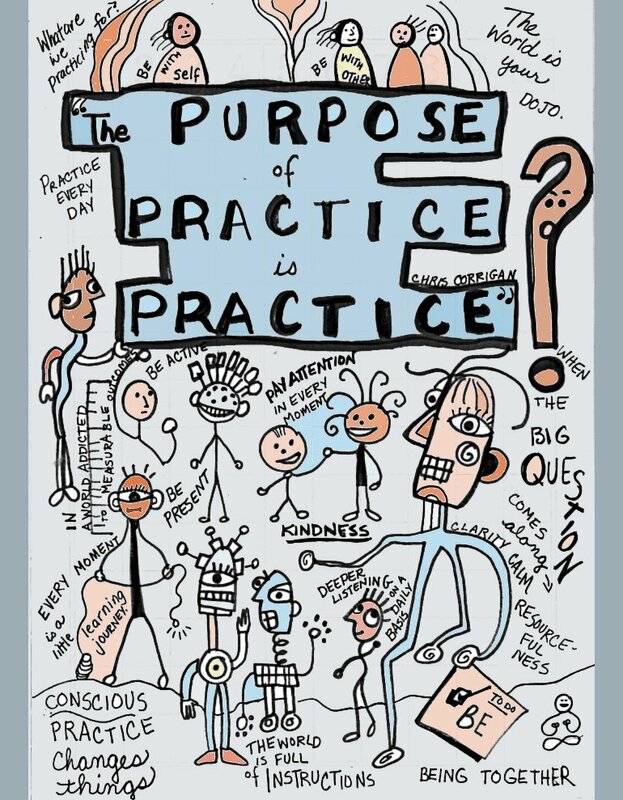 Why would I want to practice for the sake of practicing? There are several reasons for this. First this kind of conscious practice – of being present as often as possible with everyone you meet – actually changes things. It actually shifts the social spaces of our world. If you want a kind society, you cannot ask for others to provide it for you. It arises to the extent that you practice it, in every moment. Starting right now. And if you want to become good at working with other people to make creative decisions and chooses about the problems we face together, practicing on a daily basis and in small ways gets you ready for big and surprising challenges. It prepares you to meet the challenges that come on so fast that you have no time to learn how to deal with them. Practicing kindness, possibility seeking and deep listening on a daily basis ingrains those skills and capacities. It makes you a better facilitator. It makes you a better parent and a better citizen. It even makes you a better cabinet maker, a better financial analyst and a better claims processor. But there is no goal. You cannot practice with the idea of achieving an 80% efficacy rate in generating creative listening in the moment of deepest crises. Practice does not lend itself to these kinds of metrics and targets. So let go of those expectations. Practice for the sake of it and revel in the small shifts that happen around you. Become present simply because it is a better way to experience the world. Participate fully in your interactions with others, ask good questions and experience what it is to be hosted. Step up and practice kindness in daily interactions to discover the core practice of hosting challenging spaces. And find a place, moment by moment, to co-create the world you want to live in. Those of us that work with people have a terrific opportunity to practice and improve in every moment. Approaching our own training as a life long practice opens the possibility that we might get very good at it very quickly. Consider this an invitation to do so. The world is your dojo. Go practice. Practice is the practice. Makes perfect sense. Thank you. Chris– *really* helpful piece. I know several people for whom this will be a blessing. Thank you! This really rings true. It’s a profoundly spiritual practice, being present to another person..being present with myself..present to the Spirit between us. thanks chris. Thanks, Chris. This opens up much for me and connects what seems to be separate practices in my life. I sketched out my reflection of what you said at http://slowlearning.org. Patricia…that is BEAUTIFUL! Thank you! Have been lurking around this blog for quite a number of years now. This post, and the graphic summary that you included, is simply and deeply profound. It provides a framework for both the effort and the intent that goes into living a conscious life. Would you mind if I use your graphic as background on my PC? I’m a stay-at-home mom with a desktop PC, and only my husband and my son ever comes into my “study”. Thanks for leaving a little footprint Melinda.